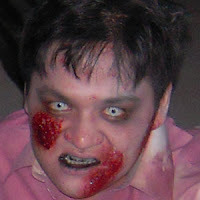 In creating Halloween makeup, using cosmetic lens is the the surefire way to achieve a scary or mysterious look easily. If you have a deep set eyes, your look will appear more convincing even with no horror makeup applied on your face. However, do be aware that not all cosmetic lens are safe for use. As always, there are suppliers trying to win market share buy selling the lens so cheap online or at non-optical shops. Obviously, they could sell cheaper because they just copied the design from the original brands and bypass quality and safety checks. So, before you commit on buying any, here are two good articles to read. I'm sure there are many other cases and articles that you can Google online. Eyes are one of your most important asset. Getting cheap lenses from unreliable sources are just not worth it. You may spent so little on the lens because you want to save $100, but if your eyes are damaged, there is no turning back. 1. You should never buy lenses from street vendors, salons or beauty supply stores, boutiques, flea markets novelty stores, Halloween stores, record or video stores, convenience stores, beach shops, Internet (unless the site requires a prescription). 2. True story on the negative implications of cheap cosmetic lenses. If you are looking to create character looks such as Zombie, Vampires, Black Swan or Mad Hatter, contacts lenses such as ColourVue Crazy Lens offer a lot of choices and is one of the most reliable cosmetic lenses to consider. These lenses are sold at optical stores and can therefore be trusted. For more information on ColourVue, visit http://www.colourvue-lens.com. The pictures below are taken from www.makeovermagix.com. Makeup by Rezani Ramli. Contact Lens using ColourVue Crazy Lens - [L] Red Devil, [R] White Out.